You are here: Home / News / Eric Reid: Apologetically BLACK. 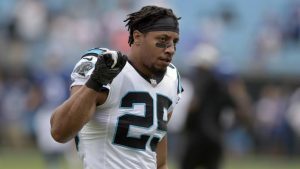 (ThyBlackMan.com) Since Colin Kaepernick is not on the sidelines of an actual NFL field this season, the current NFL player who most represents what Kaepernick was pushing for in 2016 is Carolina Panthers safety Eric Reid. After seemingly being blackballed by the NFL this summer by NFL teams and owners, Reid was finally signed by the Panthers in late September. Last year, he had previously filed an official grievance letter with the NFL alleging that team owners and the league had colluded to prevent his employment due to his protesting during the national anthem. The one thing is certain about Eric Reid’s return to the NFL is that Reid is going to be vocal and authentic about his blackness while pulling no punches about social issues. During his introductory press conference, Eric Reid displayed multiple levels of being unafraid of being socially outspoken. He wore an “#IMWITHKAP” T-shirt, while speaking with media members, which is a T-shirt that shows support for Kaepernick and his stances against police brutality and injustices against black people. However, what Reid said during his first press conference was an even more important message. When he was asked about his strong social stances on and off the football field, Reid replied, “I’ll put it this way – next year will be 2019. It will mark 400 years since the first slaves touched the soil in this country. That’s 400 years of systemic oppression.